Alright ladies. It’s time to get to work. We all know how much squats can help the booty but they can get pretttttty boring. If you have 20 minutes a day (3 days a week), you can sweat your way to a better booty. YUP, just 20 minutes. You can thank me later. This is a do-anywhere workout. Do it while your kid naps, or heck while your kid is in the room. Do it in the AM or right before bed. You pick. Let’s chat about each workout and how to do it. Single Leg Glute Bride: Lie on your back with your knees bent and the bottoms of your feet on the floor. Extend one leg. Push your hips up toward the ceiling (as high as you can) while squeezing your glutes. Pause for a sec, then lower. Reps: Do each side for 1 minute. Repeat 2x. Donkey Kicks. Begin on all fours with your knees bent hip-width apart and your wrists/arms over your shoulders. Keeping one knee bent at a 90-degree angle, kick the opposite leg toward the ceiling (as high as you can) while squeezing your glutes. Pause for a sec, then lower. Hydrants. Begin on all fours with your knees bent hip-width apart and your wrists/arms over your shoulders. Keeping one knee bent at a 90-degree angle, lift the opposite leg out to hips-height while squeezing the glutes. Pause for a sec, then lower. 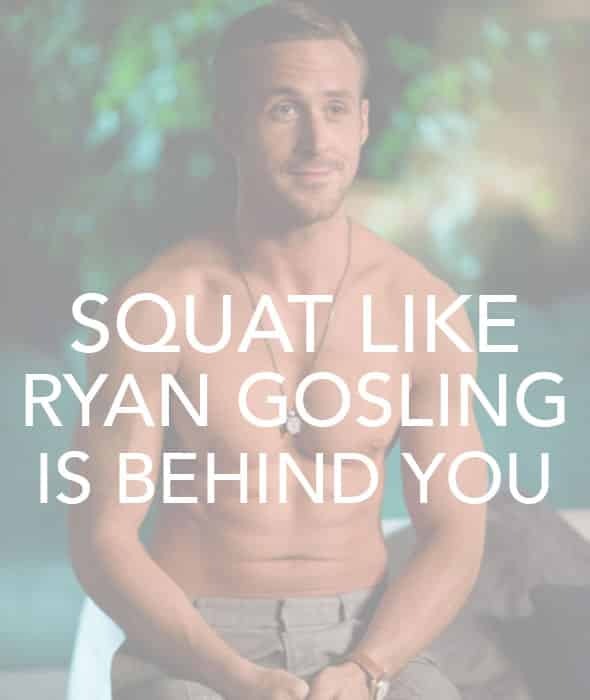 Basic Squats. Begin with your feet slightly wider than shoulder-width apart, toes pointed forward. Keeping your knees behind your toes (very important), sit your hips back into a squat as far as you can. Stand back up straight and repeat the motion. Reps: Do for 1 minute. Repeat 2x. Curtsy Lunges. Stand with your feet hip-width apart. Keeping your hips square, step a leg diagonally behind you and bend both knees as far as you can (try for 90-degree angle) while squeezing your glutes. Pauce for a sec, then return to starting position. Now go conquer this Monday with a workout that will kick your booty! Don’t forget to subscribe to my YouTube channel for more and upcoming videos! Previous Post: « So Much Love for OrangeTheory Fitness.